An after-dark walking tour through the streets of Parramatta. 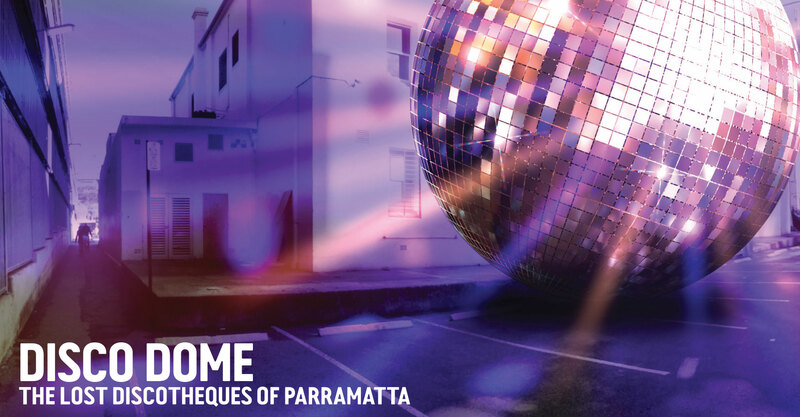 ICE presented Disco Dome for Sydney Festival 2015; an after-dark walking tour and dance event that revisited/reworked Parramatta nightlife (1978-1995). Disco Dome featured pumping music, contemporary art, live performance, architectural tours and talks, community reminiscence, food, cocktails and an old skool Disco Inferno. Disco Dome ran from 8pm to 12am for three consecutive Friday and Saturday nights during the Sydney Festival. The tour cast its glitter eye on the times and tensions when Australia (and Parramatta) was moving from Anglo monoculture (read Pub Rock), to multi-cultural haven (read Disco, R&B, Hip Hop). Nowhere was the clash of ‘flannelette’ and ‘satin’, ‘head bang’ and ‘boogie’ more evident than at Parramatta’s legendary ‘War and Peace Discotheque’ (1978-1986) where most nights it delivered on its name. The infamous Lucky Lil’s Nightclub was brought back to life for the event as the venue for a range of specially commissioned film, digital, recorded/audio and performance artworks from some of Australia’s leading contemporary artists: Liam Benson, Khaled Sabsabi, Justene Williams, David Capra, Heath Franco, Fadia Abboud, Jerome Pearce and Zehrish Naera. Each night was capped off by legendary DJ Danny K coming out of retirement to Relight The Fire, and spin a live old skool disco.